Here I am, at last, with a final Living & Dining Room Makeover post that wraps up the whole project. Now that it’s all finished, I can honestly say that there is nothing I would do differently. Design and decor decisions can be hard, especially when there is a budget to follow. The sky is definitely NOT the limit so compromises have to be made at some point along the way. I made some compromises, but in the end, I have rooms that reflect my family and that fit with our lives. I’ll start with before & after pictures, followed by a cost breakdown and some final thoughts. For more before pictures see my Home Tour Category. I’ve learned many things in the past five months. My makeover may seem small to those of you who have renovated an entire house, but for me it was a big deal. I had people in my house every day for six weeks. That was a challenge for someone who works from home. I learned how to work around them and still be somewhat productive. No one is a mind reader. I learned that if I wanted something done differently, or wanted something changed, I had to ask. Asking nicely always helped. There were several times when I wasn’t sure what came next. I learned to be patient and at the appropriate time, everything fell into place. Would I do it again? Absolutely. The only time I truly thought I was crazy was the day the workers began to jack hammer the floor in the powder room! This is hard for me because I was always taught that people’s finances should be private. Sort of old school but it’s true! I talked it over with my husband and we decided to share a cost breakdown. There are many gray areas where home renovation is concerned and cost is one of them. Maybe this will help some of you figure out your own budget. As I see it, there are three ways to pay for a home renovation. Home improvement loans, refinancing or some sort of credit. Inheritance or some other type of financial windfall. We chose option #3. I had been saving my blog money for about two years so I already had a good amount put aside for this particular project. We added to that with other savings and were able to complete the entire project without going into debt. This option takes planning and strictly sticking to a set budget. When the money is gone…it’s gone! I got the estimate for the flooring (which had to be done) and then decided what else I could do. The board and batten was definitely a splurge, but I really wanted it and was determined to make it happen. Since we were working with an insurance claim, we were able to get that figure down to about $6,000.00. For details on what happened to prompt the whole renovation, click HERE. After looking at the final bill, my best guess is that the dining room came to around $2,000.00. Unfortunately, I can’t break down what part of that was labor and what part was materials. It goes without saying, but I’m saying it anyway, that if you can do a project like this yourself, you can save a lot of money. I cannot, so paying for labor is just part of the process. One more thought…I used to think that because I wasn’t a “power tool girl,” there were things beyond my reach in regards to home improvement. I don’t believe that anymore. If I can’t do something myself, then I need to carefully budget for labor. It’s just part of my life and accepting it was actually a very good feeling. If that means I need to take more time to save money, then so be it. No one knows better than me that $12,000 is a lot of money. Other than replacing our roof several years ago, we have never spent that much money at once on any home improvement project. When I was faced with the decision on how to replace the damaged floor, I knew I had to take a leap of faith. If I didn’t go for it, and put hardwoods through-out, I knew I would never do it. So I took that leap and am so happy that I did. This post was much harder to write than I had expected. I tried to include all the important details, but if I left anything out, please leave a comment or send an email. I will do my best to answer all questions but I am far from a home renovation expert. I’ve had a few requests for actual floor plans of my house…especially my kitchen. Honestly, I have no idea how to do that. I am planning a more detailed post focusing on small kitchens which I hope will help answer some questions about that. Thank you for making it to the end…see you soon! Living & Dining Room Makeover | Hardwood Floors are Finished! Absolutely Beautiful! And also very timely for me, as we are just beginning our living room and dining room make-over. Thank you so much for the time and effort you put into your wonderful blog. I love your rugs in the living and dining rooms. Where did you purchase them? I’ve been looking for something similar. Great job! We remodeled a few years ago and it was a very exhausting time! We decided to use cash, too. But we had to make some hard decisions to keep the cost in the range that we wanted to spend. Thankful it is completed and very pleased with the work that was done. I really appreciate all the information you gave on your reno. It is so helpful as we recently added a sun room to the back of our house and I want to be sure I do the right thing in furnishing it. Your info will also be helpful when it comes time to make some changes in other area of our house. Thank you so much. Ann, It absolutely stunning. What a difference !!! I am remembering what a difference your staircase was after that make over. Beautiful. It’s so beautiful, Anne. You made some great decisions. 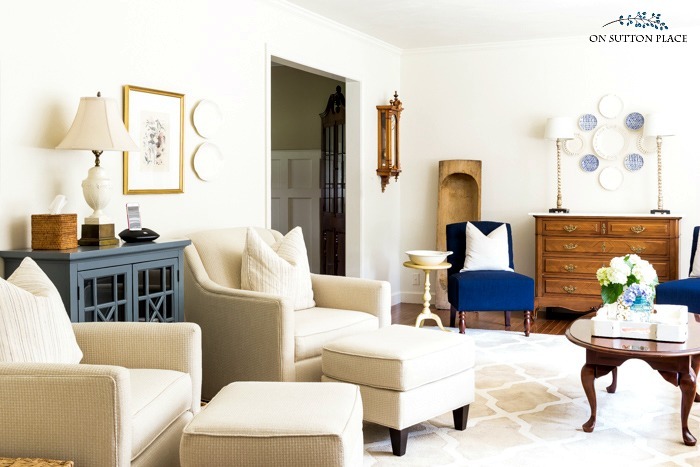 Your home is lovely–what a beautiful transformation! May I ask what you have done with the corner cabinets that were in your dining room before the remodeling? I thought they were perfect with your table and chairs and showcased your heirloom glassware so nicely. Your blog is one of my favorites–always so tastefully done. Please keep up the great work. The corner cabinets are still in the dining room! I guess I neglected to include a photo from that other angle. I will make sure and do that the next time I feature the dining room. Thank you! It looks wonderful, Ann. And this post was super helpful. Thank you for being transparent and sharing with us regarding the financial aspect. I know it’s can seem ‘strange’, but it is appreciated (thank your hubby, too!) I think ya’ll did a wonderful job in keeping costs down. Such a BEAUTIFUL finish!!! We’re not surprised — your taste & ingenuity ordained it. 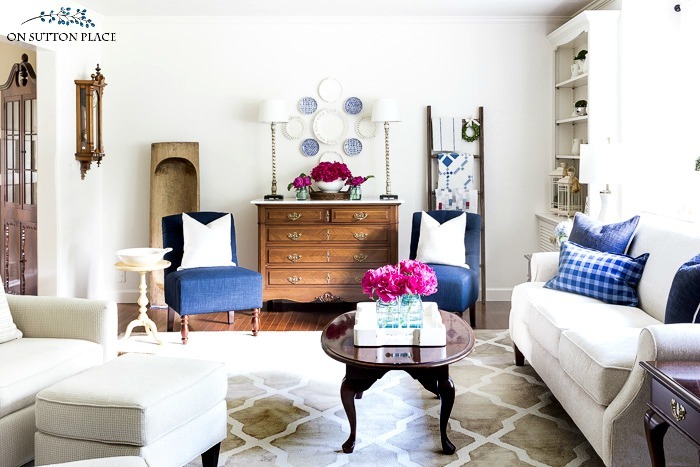 I love how your rooms turned out and thanks for sharing the process you went through. Your house was lovely to begin with, but changes you’ve made are amazing. I love that you’ve shared all the links of where you shopped. Enjoy your new space!!! I love it! You made wise choices, and that board and batten – – – AMAZING! It is beautiful. I really like the choices you made and how the end results were accomplished. Beautiful transformation!! 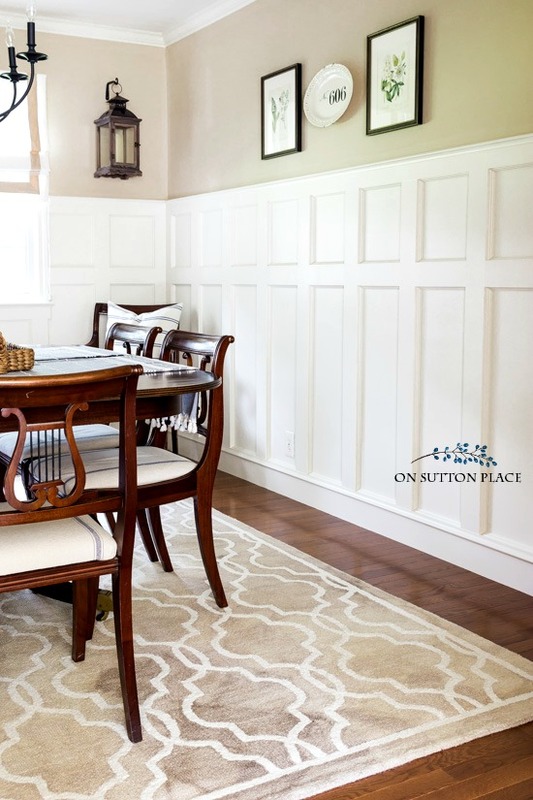 I love the board and batten in your dining room. Thank you for sharing! Love what you did and at such a good price. Enjoy ???? Love what you did and at a good price. Good for you. Enjoy ???? Fantastic! First, it’s very beautiful. I love that you posted this, I am in the process of planning and updating our whole house. This was extremely helpful. My first step was to volunteer for Habitat for Humanity where I met wonderful people who have the skills and know people who have the skills to do this work. I am a DIY’er so I thought working with them would help me do at least some of the work myself. I didn’t know where to start so I signed up for a Women Build project and I learned so much. I tore off a roof and replaced it, took old plaster and lathe walls down to studs and hung, taped and mudded drywall. I haven’t done floors yet or hung doors which are the two main things I want to learn. I know that I will have to hire some of the work out, but this gives me ideas of what I might not even want to do myself and the things I enjoy and am good at. You are right it’s so expensive, but there are things you don’t want to take a chance on. Reading this just gives me more confidence to get started. The most helpful for me is the order of events. You posted wonderful pictures and your plan all along the way which is not my strength. I tend to get excited and start one project, then bounce over to another one and the work is kind of haphazard. This makes me see the importance of having the whole plan, then break it up into manageable projects. Thank you for posting and it is just lovely and clean and fresh. I love it! This is such a pretty renovation. I love all of your choices. That was brave of you to include costs, but very helpful. It is hard to know what things cost if you have to hire help. Saving and waiting are always the best way to go. Now you can just enjoy it and not worry about making payments. I enjoyed your deck table all set up. Just wondering if you are planning on sharing your back porch this year. I always look forward to that even if you don’t have new things. It is so pretty and summery. Oh, my goodness…how very wonderful your updates are. Especially enjoy that you keep a lot of your furniture in its original, wood finish (vs. painting majority or everything); that you use color (vs. mostly grey); that your neutral has some beiges (vs. grey); and finally, the enhanced wainscoting. Absolutely terrific! One consideration for the future might be to think abut either adding a cornice over the dining room windows or lifting the blinds (just gorgeous) up higher, which will make the windows seem taller and larger. With or without this suggestion,, your remodeling efforts are top notch! TKS for sharing the details, too: sources, cost, and experiences! Vunderbar!!! Well done!???? I’d say you got quite a lot of bang for your buck! My husband and I recently installed hardwood over 3/4 of the ground floor of our home. Also added premium vinyl in our powder room. The total cost for the flooring in our Iowa home was $9000. We have loved it for two years and will never regret the cost or the mess. Thanks for the great before and afters! So fresh and clean looking beautiful roooms. is the hanging lanterns in the dining room. I have a thing for lanterns!! Many blessings as you enjoy your newly decorated space! Thank you Ann for sharing your budget information. My husband and I are firm believers that a budget is the key to any renovation and even a content married life and family. Many do not realize how compromise and patience can bring about a beautiful home without breaking the budget. I am ready to come over for lunch! Another thought, have you read anything about “The Academy” in France? Oh Ann, you must start saving to go! The experience would be a wonderful opportunity to share your talents and experience those of others. Let me know what you think. Thank you Barbara…I will take a look at The Academy but I’m not much of a traveler! Love the paint color in the dining room. Care to share the brand and color? Your renovation is stunning! 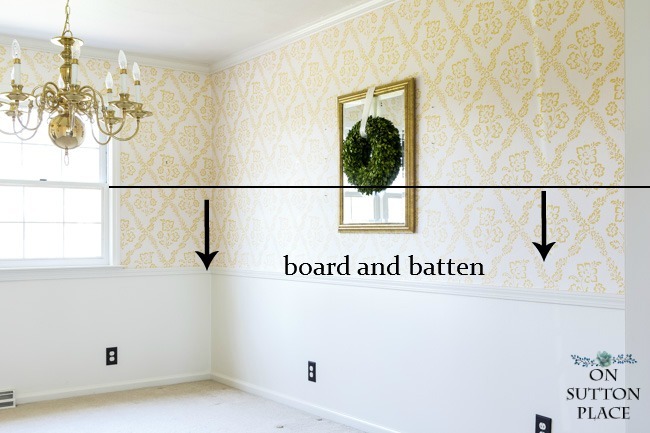 I love the wainscoting! Your decorating style is classic and exquisite. I look at your rooms and think about how the renovation began. With effective planning, attention to detail, hard work, and patience, your home again shows its beauty and serenity. Thank you so much for sharing the process with all of us. I hope you and your family have a wonderful July 4th! It is beautiful what’s difference. Now u can sit back & enjoy! what a beautiful job; you did yourself proud! 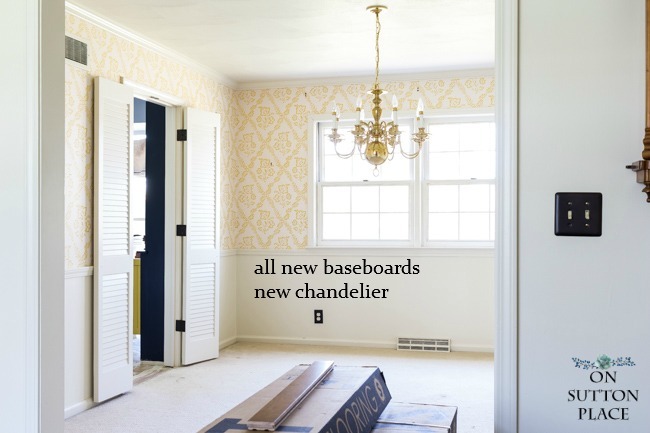 thanks for the links as I LOVE the chandelier and have long wanted to update ours! So lovely. Tasteful and elegant. Congrats on staying the course, Ann! Also, thanks for the cost breakdown. It is useful information to have in the off-chance I embark on some up-dating in my own house. I hope you enjoy the heck out of the renovations as I know you are already. Ann, your renovation is lovely. Thanks for sharing the details! Gasp! It is all stunningly beautiful, Ann! We are cut from the same cloth and I hate to talk about money, but I would say you got your money’s worth and then some with this project! We have discovered a leak under the house and have a plumber coming out tomorrow to determine its source. And of course, all I’m thinking about is $$$$$$! Everything looks gorgeous! Wonderfully choices you made. I appreciate you sharing your budget. It’s nice to get an idea of what things cost other individuals and it gives me a guide to compare to. It appears you got quite a bit for your money, and it’s beautiful! It turned out beautifully.so fresh and clean. Very welcoming. Thank you for this honest post. I hate to spend money so $12,000 sounds like a lot to me too. But, I think you got a lot for your money. I learned a hard lesson when I chose Pergio flooring for our living room and entryway even though we had hardwood in the bedrooms and hall (someone told me our dog would ruin the hardwood – not true). I spent $4000 for the Pergio 14 years ago and have always regretted it. Someday I will get hardwood. Your project is beautiful and I love your blog. I had Pergo as well. It was all I could afford 10 years ago and it served me well. I hope at some point you get the hardwoods you want! We are getting ready to add onto our small ranch style home and so I’ve been following your posts about the renovation with avid interest. We saved up for and are paying cash for this as well. Because we are both retired, we did not want to incur any debt. We have hired a builder and are waiting for blueprints of the project. We’ll be adding a dining room, a powder room, upstairs laundry area (right now it is in the basement) and pouring a new patio and sidewalks AND building a new garage. My husband is turning the existing garage into a woodworking shop for him. Estimate for completion is two months. I find things like this stressful because I dislike confusion and clutter but I know it will be worth it in the end. I love everything you’ve done. Just curious. I loved the blue rug in your living room. Did you get rid of it or move it to another room? Your home is lovely. So pretty and yet so warm and welcoming. Thank you for sharing it with us. I gave the blue rug to my sister-in-law. It ended up being too small for the bedroom. She was thrilled! I loved that you were not afraid to make the changes in your home. I change things gradually because I still love what we did in our old house 20 years ago. Sure, I would like to change a thing or two but it’s not something that HAS to be done now. It can wait. We love our old house and the character it holds. It’s all so very nice, Ann! But I for one absolutely adore the dining room….love it. Probably because that’s exactly what I have been wanting to do in our master bedroom and bath. Thank you for sharing the financials, because I know that was difficult for you to do but so helpful for so many. I would do a lot of the work myself so that will save me some money, but after my husband was laid off for 5 months, and just started a new job in June, our savings has to be built up again. So there is no telling when my project will be feasible, since it is a “want to” and not a “have to”. Question: when do we get to see the powder room? I did show the bathroom a while back. 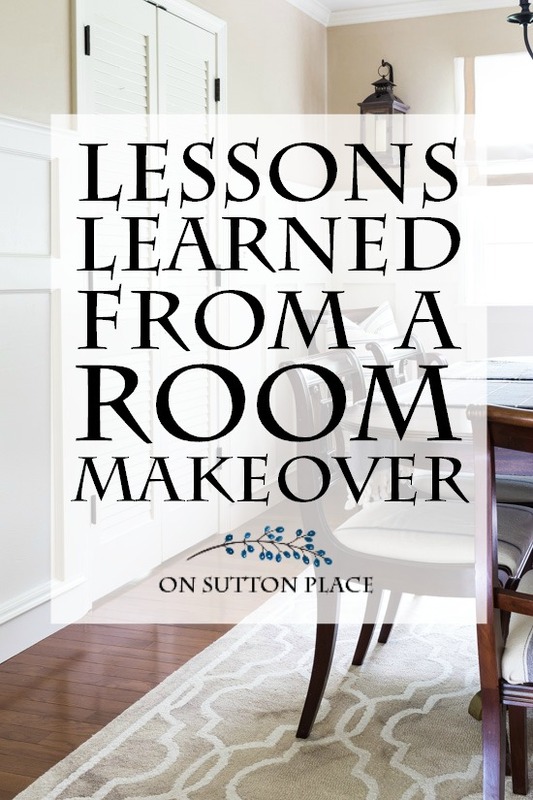 Here is the link: https://www.onsuttonplace.com/5-easy-ways-to-update-a-bathroom/ I will try to work on an update. I have new lights and had to replace the faucet because the one pictured in this post broke! Oh, I missed seeing it! Thanks for the link and I looked at it. Really nice, fresh and airy feeling now. Thanks again, Anne….and by the way: I would not paint the sewing cabinet….what a nice thing to have in your possession. I love the way your home turned out. I especially like the lanterns in your dining room. I am contemplating a dining room makeover too. We are looking at possibly doing board and batten, as well as a built in hutch/China cabinet. Luckily my husband has the tools and skills to do everything himself. He has saved us so much money as we update and upgrade our home. It’s just beautiful. Thanks for letting us walk along. Your home looks wonderful. I see items in your rooms that I would overlook while shopping but seeing them in your pictures allows me to think outside my normal decor for something different. It all looks beautiful; warm, inviting and comfortable! I really appreciate the before and after pictures – they truly help tell the story. I am happily looking forward to how you dress up these rooms for fall and Christmas! I love it! We put hardwood floors throughout our ranch style home about a year ago. We had a a wall removed between our living room, kitchen & dining room. We basically end up with one big open area. That was not my idea to begin with but was pushed & shoved along with the idea by our adult children & their spouses. They wanted everyone to be together at all the family get-togethers. Getting back to floors, I wasn’t sure what to do. The company we worked with took care of all aspects of the remodel. Right away they lead me to hardwood. I was scared to death. I had all the reasons why we shouldn’t have them & they would give me reasons for having them. We did it! I can’t believe I thought of anything else. We do have the area rugs in the living & dining area for some warmth. We did well with our budget on that remodel which included a kitchen & laundry room. However, four months later we decided to do our master bathroom. That got totally out of hand. We have one of the nicest top-of-the-line bathrooms. My husband worked for a plumbing & heating company so a lot of it was time & materials, but he got a little carried away with some of the “bells & whistles” they offer for showers, sinks & stools. Ahhh…we are thoroughly enjoying it! Now if it would only clean itself???? Enjoy your new remodel…it’s beautiful! It looks beautiful. Colours are great and isn’t it a treat when you can use your own things? Your home looks lovey, all your hard work and savings has paid off ! Enjoy the new hardwood floors and all the trimmings! ???? Ann, thank you for sharing with us! Your home is just gorgeous! You have so many great ideas which you were able to implement! Just love how you decorate! Everything you do is just so beautiful! Enjoy your home! Blessings! It all looks so perfectly neat as can be! Love what you have done, but secretly miss your cheerful dining room paper! ???? I know we all need some change in our lives so you were probably ready for that change. The board and batten was very well done. I love your home. May I ask what is at the living room window? I can’t see for all the glorious sunshine. Did you make new drapes? There are ivory panels trimmed with a khaki border in the living room. I have tried to get a decent photo but no luck so far. I will keep trying! Ann,everything is beautiful. You did a lot for the money. I’m already running a fever wanting to do something. Thanks for sharing the financial part of the process. After renovating a large craftsman from top to bottom, I can appreciate your adventure in remodeling! It’s all very pretty and nicely put together. Really like the lanterns and the dining room chandelier. Enjoy the fruit of your labors! It all looks amazing and know you set and smile at it. My wood floors were in my house when i bought it but i redid them and won’t ever have carpet again. Everything is so beautiful! I know you’re glad it’s over. I especially liked the golf ball ???? . Your “new” home is lovely, Ann, and I’m so happy for you that you were able to turn it into exactly what you wanted (ok…maybe with a few limitations); our homes are our castles, where we want to be “at the end of the day,” so why not make them what we want them to be, to the best of our abilities and as situations allow? Why not do what makes our heart sing? I truly admire you for having SAVED for your renovation – how positively old fashioned…and quite the blessing, now that you’re done, wouldn’t you agree?! Enjoy the fruits of your labors…you deserve them! Hi Ann thanks so much for sharing about your renovations! I loved everything but especially the walls in the dining room. It looks so awesome and very expensive I might add. I wonder if you would consider doing a piece on how you came to be a blogger and how you got started. If you have already done this please direct me to the article. Thanks and have a great 4th???????????????? I don’t think I’ve ever written a post on that specifically…I will give it a go! Wow – your home is beautiful and your post came at a great time for me. We recently retired, and are downsizing and moving to a 55+ area of a retirement community…to an apartment home. It is beautiful and the perfect size and floor plan for us…but then come the “options”. And wow, as you said in your details…it can add up. And you have to make compromises. I loved your comment about “asking nicely” when you wanted something done…we have built three homes and I was always there everyday during construction…asking nicely, bringing drinks and treats. This time it is different since it is an apartment building under construction. Got into the building one time when it was just dry wall. Will have a walk through in a few weeks, move in in August. BUT…I was so excited to see the new rug I chose was VERY similar to yours and I admire your good taste, so that makes me happy. Even our new hardwood is similar. Can’t wait to see our finished product. I thought this would be a good time to start my own blog…lots of changes as we enter the next chapter of our lives. Don’t think I will ever make money off of it, but hope to get great ideas from the blogging world. Thank you for sharing your story….have a fabulous 4th of July! Wow Ann it all turned out so beautiful. I have always LOVED your home but I do have to say the hardwood makes it all pop. The new wainscoting is gorgeous! All your little accent details….love it all. It’s because of my passion for your living room that I have decided to go with a flat back sofa and chairs with our living room update. No loose pillows other than accent ones. Your room always looks neat and I like the clean lines of the way you can add accent pillows without feeling that it is fighting pillows across the back. Thank you for sharing all the great details. I am a faithful reader and always look forward to your posts! I very rarely comment but I felt so compelled to after reading this post. I want to thank you for being so honest and for your willingness to share cost figures with us. I know how very difficult it would be to do that and I very much appreciate that you did. 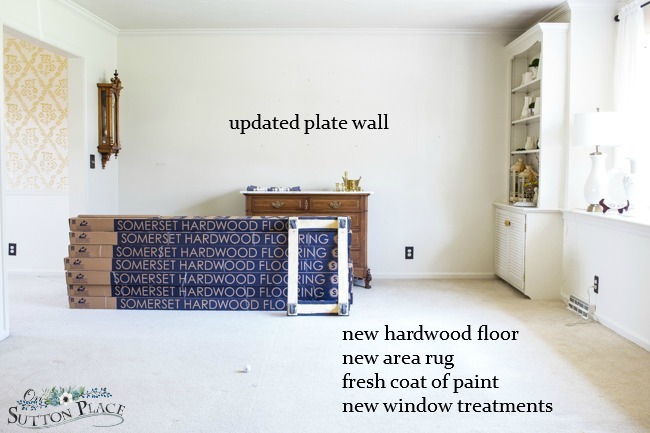 As a person who is not very knowledgeable with home renovations, I am always so overwhelmed by the beautiful blogs that seem to always be renovating, updating, replacing. BUT, in reading those blogs, I find that the majority have been “sponsored” by companies, which does not happen to the everyday homeowners. It is a bit depressing to us. So it was very refreshing and up-lifting to read your post on how you made your beautiful renovation with deep thought and planning, saving for what you wanted with some compromising, and can truly see in your words your pride. Your home is even more beautiful now! Thank you for sharing. Very well put, and I agree totally! Thank you so much for this lovely comment. I know lots of bloggers work with brands but for some reason they have never been interested in me. That’s fine…I don’t really mind. I never thought of it the way you explained it…but I do understand. Thank you for sharing! I love everything you did. It is lovely, and so welcoming. Thanks for sharing the details of your renovation costs. It is very helpful to get a general idea of what these things may cost. Home improvement TV often, I feel, really underestimate these costs and timing. Great to have a real “reality” check. THANKS!! Ann, Thanks for sharing your lovely home and your finances for this project! We always see, but never know the cost. This too,, is important so we grow as homemakers. I could not agree with your statement about saving longer for the project you can’t do yourself. I am sooo happy for you and your family. Great job! ???? Thank you for this post. I agree that it’s very hard to go public with anything regarding finances! I appreciate that you had a budget & stuck to it. It sounds like you really took your time & made reasoned decisions. The results are LOVELY! Good job! I think what you accomplished with that budget is really great. If people are thinking about doing a similar remodel, you provided a really good breakdown. Thank you, and enjoy your beautiful home. You’ve certainly planted some inspirational seeds in my head. I love your home! It’s beautiful, understated, classic and just my style. 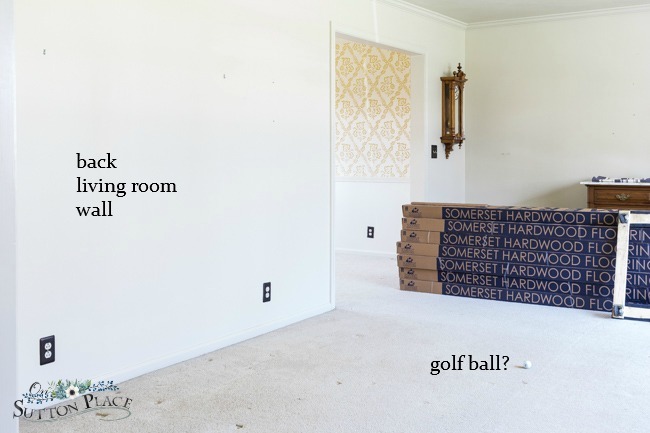 I am wondering … where did you purchase your cream colored sofa and 2 club chairs with ottomans? Or at least what brand are they? I will research where to locate this brand in my area … north Florida. Your blog is my favorite … thanks for being “one of us”!! I got my furniture at a store called Art Van Furniture. They are a chain in the Midwest. Michigan, Ohio, Illinois. It’s actually their brand. I am sure you can find something similar at a different store in your area. Good luck! It is absolutely beautiful. You did a great job! I also work from home and my husband and I perseverated about finishing our basement to include an office and bathroom. Our contractor, who is also our neighbor, gave us a fair price but advised that if we were going that far, to go all the way. We added a living room and kitchenette. We were faced with the same decision as you, home equity loan or savings. We saved the money for the project and as you said, when the money was gone, that was it. Total cost was just at $20K and the results are beautiful. I splurged for custom bookcases with a window seat between them. I made a flower garden out of the egress window and it really brightens up my office. LOVE reading your blogs. Sounds lovely…enjoy your new space! A truly worthwhile investment. Enjoy your new home Ann. It is just amazing! Love everything! Those chairs in tv area are so perfect, what is the name brand? 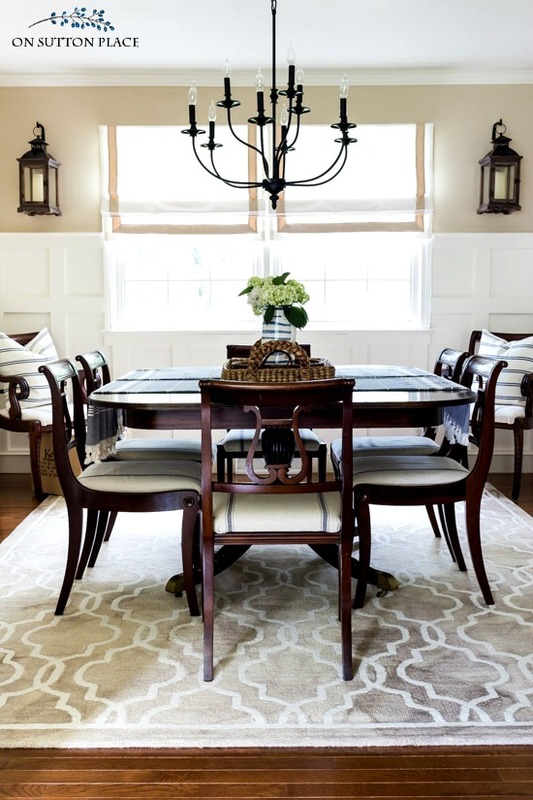 Love dining room furniture & all trim. The chairs are custom ordered from Art Van Furniture, which is a chain in the Midwest. I love this! Thank you. I, too, budget carefully. And I’m always surprised when something goes awry. For instance, I live in a mobile home in an adult community. A few years ago, a shyster (didn’t know that then) painted our home. (Yes, he had a license. I checked.) What a terrible job he did but we didn’t know that until about two years ago. My husband died in March 2016 so I had to make the decision to have the house power washed and repainted. About $2,000 all together. Then the difficult part. As the powerwashing was being done, the paint began to chip and roll off. My painted told me that the only way to get a decent paint job was to strip the house. So $$$ came into play. There is little, if any, paint left on the house now and it took about 15 hours of intensive power washing to complete. And now it will be painted (hopefully tomorrow). Two coats. Cost? About $4,000. There was no way to budget this much. The damage on the house was too noticeable to let it go. And so, $4,000 of my savings is kaput. So I know how much these things can add up. Hopefully, the paint job will last for a looooonnnnng time. Ann, your blog is my favorite because you are honest, open, and so real! And your home is beautiful. There is a true sense of practicality about you which surely your readers appreciate. In a future blog, perhaps you could address how you went about seeking bids. We’ve discovered many things about what can & cannot be done, what is practical, & have been given recommendations we’d never thought of. Bids are more than just the cost. I didn’t really get bids. For the flooring, there were two places in my town that could handle the job. I chose the one that a friend recommended. I had a hard time finding carpenters…I finally asked my flooring girl if she had any recommendations. She gave me two names. One never answered my message and I hired the other! I was extremely lucky because they were so amazing. I thought your house was beautiful before the renovations and couldn’t get any prettier! However, I was wrong… it’s gorgeous with the changes you’ve made! Enjoy and Happy 4th of July! 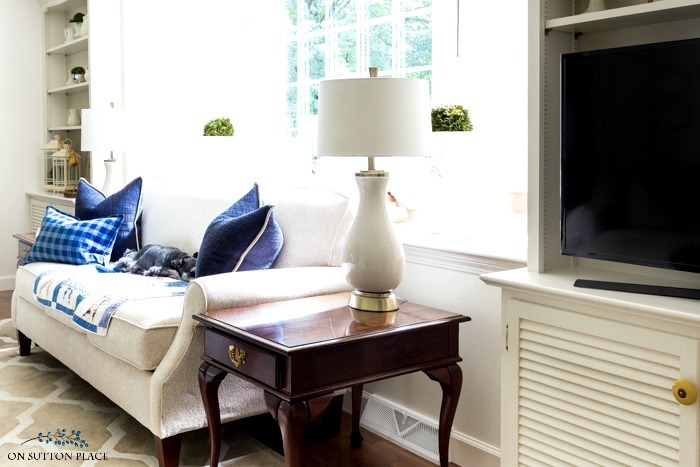 Your living room and dining roon turned out gorgeous Ann! You can tell you planed out everything step by step. I love your makeover so much, I keep going back to it! You give me such inspiration! Congrats on a job well done! I love how the renovation turned out. But more importantly is that you are happy with it. The whole project looks fantastic. Love it, as I always do everything that you post. I especially love your dining room furniture. Reminds me of the set we had when I was young. Keep up the great work, and thanks for your posts! I always enjoy your both your home and your posts about it. This time what I appreciate most is the section on how to pay for renovation. Few writers honestly address cost and how to pay for a project without going into debt. Well done, Dear Ann. Thank you for sharing this process. Renovations are difficult. Not one keen on disruption of my daily habits, I cannot imagine how unsettling it was for you. I would say it was really worth it. Cost issues are a factor for most of us I think. I agree that avoiding debt is very important. I hope that you and your family enjoy your new space and Happy Fourth of July! Your home is warm, inviting reflecting just what I perceive you to be. Having gone thru a similar experience, I feel you got a lot of bang for your buck. Enjoy, keep wonderful posts flowing and Happy July 4. 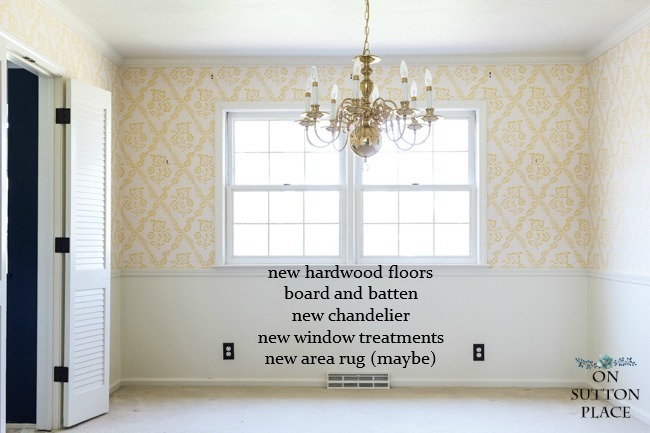 Wow…First of all, your renovation of your dining room looks so elegant yet inviting. Love the floors..such a rich color.About revealing the price of your project..thank you..helps us if we are planning a project of that magnitude. It must give great pleasure and relief to know it is done, paid for and now time to enjoy!!???? Thank you for sharing your beautiful makeover and your thought processes. I am about to do some remodelling and feel quite challenged as I have not done any for a long time. I also appreciate your thoughts on hiring tradesmen to do the work and your budget! I am so glad you’ve shared so much with us. My husband and I have redone several homes and done all the work ourselves. We have always enjoyed putting our mark on a home. We were remodelers long before the trend now and the HBtV and DIY shows. My mother used to tell us we loved making a “silk purse out of a sows ear” I honestly didn’t realize what that meant. I only knew we loved buying the house that no one wanted and turned them into homes everyone loved. And not so much by putting alot of money but seeing what they could be with hard work and good ideas. It was a good part of out lives and luckily we work well together. Last year we decided to redo our bathroom. Having never had to hire someone else to do the work we were shocked at how expensive it costs. By you sharing your renovation costs it will help others realize what it takes. It’s too to go o the bank and go in debt. I k everyone would be smarter to save for a project. We appreciate things more by doing this way. Ann, your ‘new rooms’ are beautiful. You’ve done a fantastic job with design and detail. You get an A+ from me! The bulk of your money spent is your new hardwood floors and we all know how expensive that is. When you are retired every $ is accounted for. I think your home is gorgeous! Just my style! I believe in the saying “time or money” when doing many of the overwhelming needs of home ownership. I can barely keep up with gardening, cleaning, repairs, much less the thought of trying to complete an extensive project myself. The professionals are so efficient in their fields and are able to troubleshoot problems. I am not! Plus,my errors eventually cost me more in precious time and monies wasted. Nor are they able to do my day job. So, I am forced to do just as you did. Planned, saved, and waited. The reward is definitely yours! Just beautiful. I think that is money well-spent! There are many things I *can* do myself but, when I’m honest with myself, I know I’ll never get it finished so I hire someone to do it for me. Plus they’d probably do a better job. Thank you for sharing the breakdown! It’s very helpful when planning a budget for a project to see how much it cost. Your rooms look beautiful!! I love the dining room transformation, especially. Ann, your reno turned out beautifully! I know that your are enjoying it. Thanks so much for sharing the budget breakdown. Projects like this always cost more than we think they will and your info will help keep so many of us realistic! Hey Ann – such a wonderfully organized post. Renovations seem so chaotic to me and reading about them makes me think I’ll never be able to undertake one. I always have thought that people who are able to renovate are “fly-by-the-seat-of-your-pants” types, rather than the more OCD-type, linear thinkers. I tend to be in that latter category, and your post gives me a little courage! Can you share with us the significance of the 606 decal plate? Such a great idea to memorialize a meaningful number. I can think of several ways to use it, and I’m curious what yours means to you! As someone forced into early retirement, I too live in a house needing an update everywhere I look but with limited means to make the changes I envision. I do a room at a time, pay as I go, and do 99% of the work myself. I always have to compromise and a project takes forever but I am still happy with the successes I’ve had. I am inspired by your blog and wanted you to know how much I appreciate your willingness to share cost figures with your fans. It helps to know how much it costs to do certain things and that I’m not the only one with limits to their decorating budget. 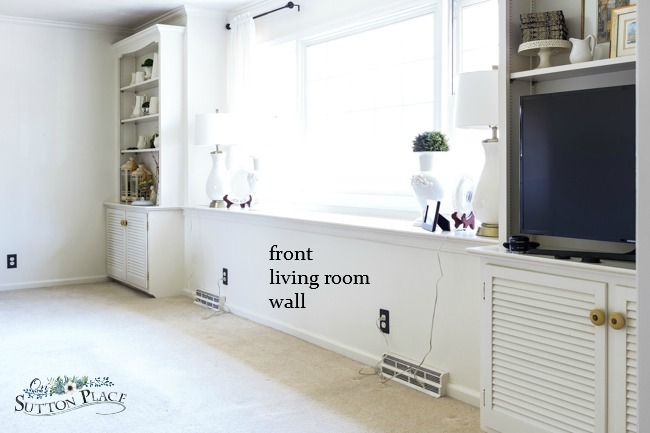 Your new living/dining room are beautiful-my favorite element is the wainscot. You had some fine craftsmen underfoot. Looking forward to more great ideas!